The St Thomas More College players and officials. 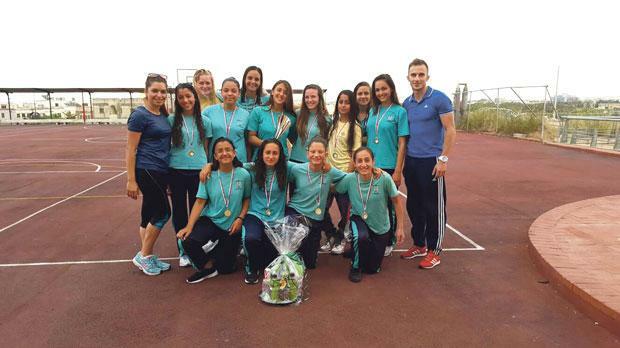 The girls’ waterpolo team representing St Thomas More College, Sta Luċija, have won the Inter-schools Tournament for the third year in succession. The team took part in the competition held recently over two days at the National Pool Complex, Tal-Qroqq. During the first day of qualifying matches, the St Thomas More girls played against the sides from St Monica, St Martin and Sacred Heart and they garnered the most points. The medal matches were played on May 19 with the STMC team, once again, beating all their opponents to make sure of retaining the title they had won the previous two years. The success for the STMC girls was even more remarkable and appreciated by the college and the teachers involved as most of their players were unable to practise adequately in a professional pool at the school. During a celebration assembly, the head of school presented the team with their trophy, emphasising the importance of healthy living through sport during an address to students.